Along the way there are songs to sing and great games to play. So, let's all get fired up for The Bedbug Bible Gang Pentecost Party! This delightful program combines 3-D computer animation with illustrations and live-action puppets. Bedbug Bible Gang: Pentecost Party DVD was published by Vision Video in June 2006 and is our 4160th best seller. 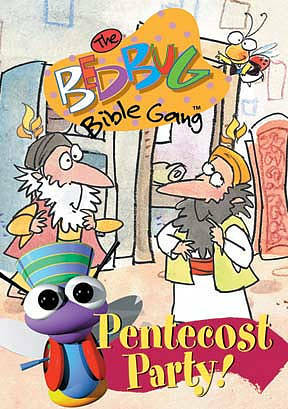 The ISBN for Bedbug Bible Gang: Pentecost Party DVD is 727985009278. Be the first to review Bedbug Bible Gang: Pentecost Party DVD! Got a question? No problem! Just click here to ask us about Bedbug Bible Gang: Pentecost Party DVD.